Spending an entire week at Airventure is something most pilots would love to do. It goes to reason then that flying a rare biplane to the event would be even better. And truthfully, it is. Why then do I not miss it? ﻿﻿In years past it was almost sad leaving Oshkosh. This year though was different. Due to an unexpected unfolding of events, I ended up at Oshkosh with an amazing plane and no passenger. Fortunately, my brother came up late in the week and between him and a few good friends, there was enough conversation to carry me through. When it came time to leave, I climbed in the plane and called my brother to coordinate an unlikely rendezvous. He was taking off from another runway and the mere thought we would end up anywhere near each other was laughable but we tried. Hanging up the phone, I gave the thumbs up to the wing walker, called “CLEAR PROP”, and started the radial to talking. Rolling towards the flight line under power, people lined my path to glimpse the mechanical pinup I was operating. Jumping onto the asphalt from the grass with a bump, I began my long taxi to the runway. Along the way people waved, gave their own thumbs up, took photos, and watched as we s-turned toward departure. Reaching the end of the runway, there was a delay for departing traffic. ﻿﻿﻿﻿﻿﻿﻿﻿﻿﻿﻿﻿﻿﻿﻿﻿﻿﻿﻿﻿﻿﻿﻿﻿﻿﻿﻿Watching the warm sky and purple clouds drift by, I couldn’t help but wonder “how could I do this for a living?” Every aviator has asked him or herself the question at least once; most of us hundreds. There is simply nowhere we'd rather be. Ahead, things would set to get better. Back in Oshkosh, there was this other call I had made. Whenever I fly through the area I always make it a point to stop at Poplar Grove. Owned by Steve and Tina Thomas, I always feel welcome there so I do my best to keep them in business; not that they have any problem doing so. On most occasions my stop is for gas and conversation, but today, thanks to a friendly offer, I was set to leave my steed in their barn. Being passionate antiquers, they also insisted on meeting us in the air. Off to my right John worked the radio, “Waco you up?” Eventually they answered. As the yellow SRE flashed below, I was drawn inside to the panel; my engine had taken ill. The instruments offered no evidence of a problem yet the sound was clearly wrong and I struggled to identify the sickness. Then it hit me; slowly turning my head to the right, I found my brother tucked in tightly in the Birddog. He was bearing a Cheshire grin. My engine wasn't bad, I was hearing the Birddog's exhaust combined with mine, or so I thought. But then the engine began to rumble. Again, the instruments offered nothing. This time though I knew why. Turning my head smoothly to the left, there tucked in tight was the most beautiful Waco you ever saw, pilot and passengers also wearing grins. Internal combustions turned external, the 985’s rambling overwhelmed the conversation. We had agreed to this earlier and everyone was doing their part. I could only grin. Approaching the field, Steve pointed out Tina in the pattern. She was up flying a Kinner Bird. Falling into trail, we all then landed; SRE, Stearman C3B, Birddog, and the Bird. It was a great end to a beautiful flight and I couldn’t imagine the evening getting better. Then Steve asked if I wanted to fly the SRE. The answer was “YES” but there was a problem. Taxing into the grass, we had parked the planes together and they were drawing a crowd. 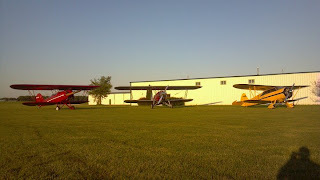 It’s not every day you see a lineup like that and many of the aviators at Poplar Grove had come out to take photos. ﻿Climbing down from the Stearman, greetings were exchanged as I stretched my legs. Soon thereafter I was met with arms outstretched. Tina gives the kind of hugs that one family member gives another and in an instant I felt like I was home. Next was the handshake. Steve gives’em the way my dad taught me; strong and looking you in the eye. Again, I was home. There is something special few airports have and you never forget them. Although there are many places on Earth that attract a lot of airplanes, there are only a handful that truly feel welcoming. Poplar Grove, to me, is one of them, and that is why I visit. They speak my language. It is also why I don’t miss Oshkosh. Thanks to Steve and Tina, and everyone else, who took such great care of us and made us feel at home. That's me, right after flying this amazing SRE Waco. Great story -- frankly, that's what flying is about. My experience with the aviation "community" has been awesome. Getting "stuck"in weather is always an adventure -- I have life-long friends from some of those adventures. Likewise just getting together with flying friends is always enjoyable. Let it continue!!! Rich, you're one lucky guy! I loved your article, your passion, your appreciation of the wonderful world you get to live in. Nice! !